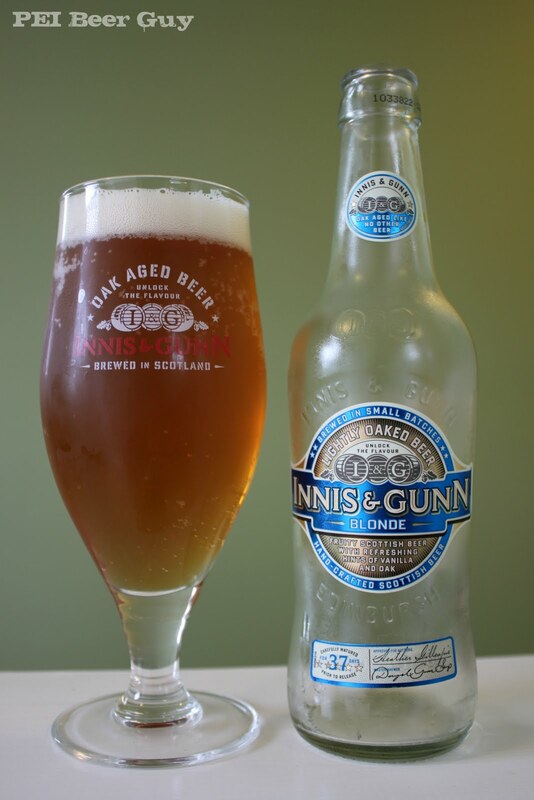 No surprises with the appearance here - as with all Innis & Gunn bottles, what you see through the clear bottle is what you get - in this case, a pale blonde ale with a bit of an orange/apricot tinge to it. There is a bit of creamy head from the pour which lowers quickly, but leaves a little bit on top all the way down. It's got that typical I&G aroma - vanilla, toffee, and oak. Oddly, some brighter fruit notes emerge as it warms (usually it's the fuller, malt notes that do this). The flavour is more of the same, but some fruit notes and light, grassy hops come out as well. The dominant flavours are the former ones. The feel is mostly dry, with a bit of stickiness. There is also a brightness / acidity to it that gives it a bit of a tangy feel. The carbonation is rather low, leaving the overall feel of this rather smooth. Overall, this is a pretty decent, easy-to-drink beer. I prefer the original I&G or some of their stronger offerings, but this is a nice beer to suggest to someone who's just starting to investigate beers outside of the mass (and flavourless) market. It has some interesting traits, but is light enough to not put someone off. I have recommended it before with such a purpose and had positive results. Perhaps think of it as good beer that doubles as a "gateway beer".